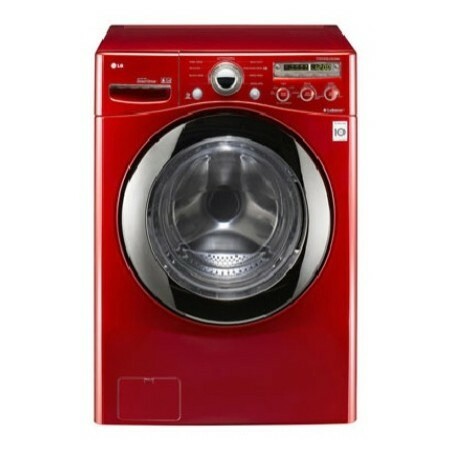 LG WM2350HRC Front-Loading Washing Machine, 4.2 cu. ft. This 4.2 cubic feet front-loading washing machine is equipped with the SenseClean System, an internal monitor which senses the required volume of water based on the weight of the loaded clothes. The 185F Sanitary Cycle removes stubborn stains and kills up to 99.99% of germs at the same time. More water and energy are saved because this washing machine is Energy Star-rated, too. 9 wash programs consist of Cotton/Normal, Bulky/Large, Perm Press, Delicates, Sanitary, Hand Wash/Wool, Speed Wash and Drain + Spin, while its 10 options include the WaterPlus and Extra Rinse choices. The ColdWash option provides the same cleaning performance of a warm water cycle without using too much energy. The SenseClean System determines the required water level based on the load’s weight, thus saving on water bill in the long run. Its 4-tray automatic dispenser adds the proper amount of detergent, bleach or fabric softener at the right time. The washer’s easy-loading TilTub drum has a capacity of 4.2 cubic feet, which can hold up to 10.1 kilograms of clothes in one cycle. It is made of tarnish-proof NeveRust Stainless Steel powered by a direct drive motor. To minimize vibration and noise, the washer tub is equipped with the TrueBalance Anti-Vibration System and LoDecibel Quiet Operation Technology. Located at the front part of the washing machine is it’s plastic control panel. This panel called the Dial-A-Cycle has electronic knobs, one-touch buttons and a cycle status LED display. The washer lets out a soft chime when a cycle ends. Installation options. It can be used as a stand-alone appliance, a built-in washer or stacked with a matching dryer to save floor space. A drawer pedestal is made available to elevate the unit. The large, circular door is made of durable transparent glass with chrome rim. Its top plate and body are made of rust-proof painted steel. To help minimize excessive vibration, four leveling legs are attached to the washer’s base. Other available color is White. The washer’s 6Motion technology use 6 wash motions, resulting in cleaner clothes. Save more on water bills with the washer’s SenseClean System, which provides only the needed amount of water based on the load’s size. The TrueBalance Anti-Vibration and LoDecibel system help minimize excessive noise and vibration. To remove heavy stains and disinfect the clothes at the same time, the NSF-certified Sanitary cycle is included in this washer’s programs. Steam does a good job in removing of stains and unpleasant odor on clothes, but this washer does not have a steam-utilizing cycle. This model does not have an allergen-removing cycle.